I have been searching for a nice simple jQuery plugin to convert a HTML table element to a scrolling element with a fixed header. The following demo page includes three tables. The top one has the desired effect including CSS styles. The middle one has the CSS styles, but has not had the jQuery goodness applied. And the bottom table is the HTML before applying CSS and the jQuery. The screen shot above is an example of the scrollable table with data in it. The HTML is semantic. The HTML is very bare-bones. The ‘tbl1’ class only adds style to the table elements. 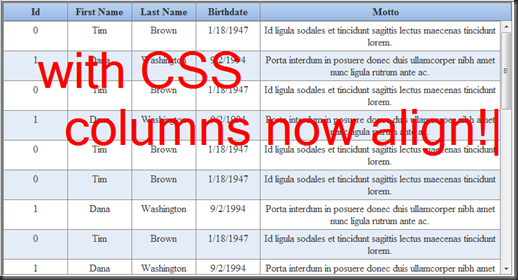 The class elements on the HTML td elements is not required, but is used to set column widths via CSS for the table. So what have we done? The biggest transformation has been to split the table header and body into separate HTML table elements. Each of these tables includes a wrapper HTML ‘div’ element (a head wrap and a body wrap). 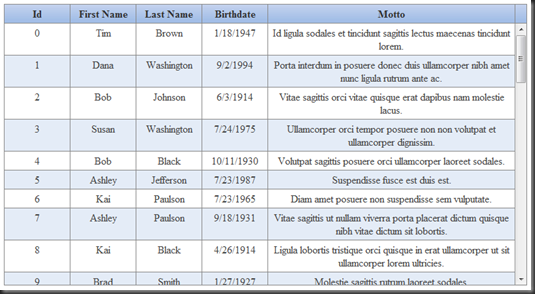 The result is placed inside another HTML ‘div’ container (a table wrap). It is simple enough to do this transformation with jQuery, but we still have a problem. This is very close to what we want, except for the case where we want the columns to auto-size. Using a bit more jQuery, we can automatically set the column widths in the table header to the same as the widths in the table body. That is the recipe for this jQuery plugin. Now, let’s get to the plugin code. There are only three configurable options that set the width, height and border. The width is applied to the body and head wrapper HTML ‘div’ elements. The height is only applied to the body wrap. The border is applied to the table wrap. The ‘prepareTable’ function is where the semantic HTML table is transformed into two tables. First a HTML ‘div’ is wrapped around the table to form the body wrap. This table currently contains ‘thead’ and ‘tbody’ elements but not for long. Then a HTML ‘div’ is wrapped around this whole thing to form the table wrap. Then a new HTML ‘div’ element is prepended to the table wrap to become the head wrap. A clone of the table is then appended to the head wrap. To enable the automatic column width setting an empty trailing column, ‘bufferCol’, is added to the table header. This is the “secret sauce” in the plugin. This element acts like an ‘expando’ and allows the other elements to have a fixed width. Finally, the HTML ‘tbody’ element in the head wrapper and the HTML ‘thead’ in the body wrapper are removed. This completes the HTML transformation. Along the way the required CSS is added to the elements. 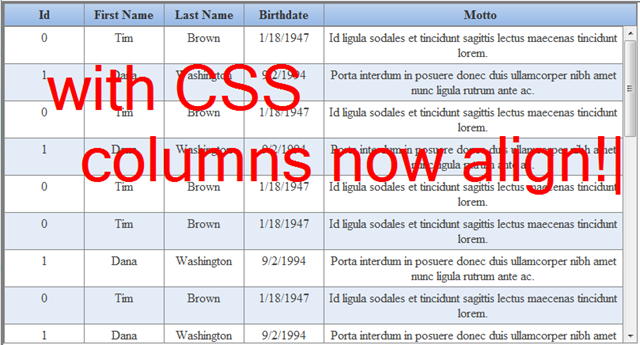 The final bit of jQuery goodness sets the width of the columns in the header to the width of the columns in the footer. There is a bit of browser variation that is taken care of in the ‘getWidth’ function. 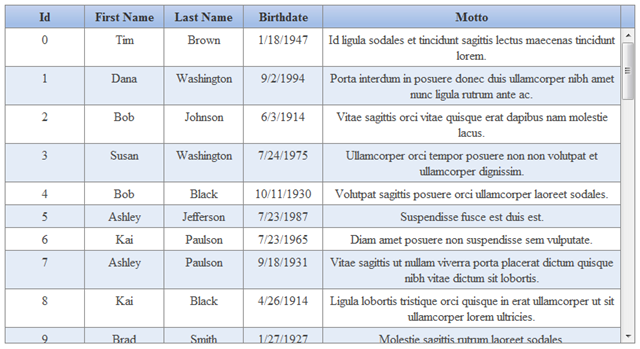 Although not necessary for the jQuery plugin, I thought that I would provide the CSS that I am using to style the tables. The plugin works using Internet Explorer 8, FireFox 3, Chrome 4, and Safari 4. Please let me know if you find issues or have suggestions for improvements. This is great code. However, one issue I ran into is if a column header cell gets auto-formatted to be wider than the corresponding data cell, the header cell gets chopped off. This is becaue the code sets the header cell width equal to the data cell width without checking to see if the header cell is wider. I haven’t done it yet, but I”m sure it’s easy enough to change it so that it sets the width of both the header and data cell to whichever one is greater to begin with. Thanks for reading and taking the time to respond. I will look into making the code a bit more robust to handle this situation. your jquery plugin is great. i used it on my project. i have a problem when displaying other table with different column numbers using same plugin. in one table, the header and body aligned correctly after editing subtraction value in getWidth function. 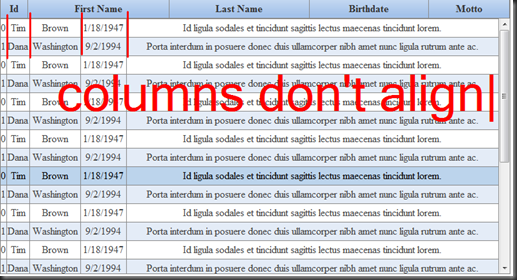 but when opening other table, the header and body is not aligned because have different number of columns. 1. in line 57 i changed the width value for bufferCol from 100% to 17px. it’s because the table showing a half square in firefox browser. Thanks for the feedback. I will look at your changes and try to get them in the next version. great plugin, but I run into an issue when using width and height in percentage instead of pixels. As I have a dynamic layout I need these values given in percentage. So, is there any solution/workaround for that? I have not (obviously) used percentages instead of pixels. I took a quick look at the code. It appears that I have a number of ‘px’ hard coded. I suspect that is causing the issue. I don’t have the time to play with the code right now. I will try to swing back around to it later. Hi Bob, have you had a chance to look into this? I haven’t been able to allocate any time to look into this. Sorry. Thanks for stopping by. I suspect it is possible. I would probably try dynamically wrapping the table and header into a ‘div’ that has a fixed with with overflow set to scroll. I suspect that playing around with the CSS a bit and you can achieve what you are asking. It is not something that the current plugin supports. How difficult do you think it would be to implement a fixed footer as well? So the end result was a scrollable table with a fixed header AND footer. Probably not that difficult. I am trying to imagine what would go in the footer. If it were just a copy of the header, then the same type of scheme could be used again. Just add another table with the fixed footer. This could probably be done regardless. If the content isn’t the same as the header, why not just add it as part of your dom? Not sure of what is causing the error. Is there a URL you can send me (bob.cravens at gmail.com) and I can take a look. If I find an issue, then I can fold the fix back into the mix for everyone. I have the same problem of Matt. 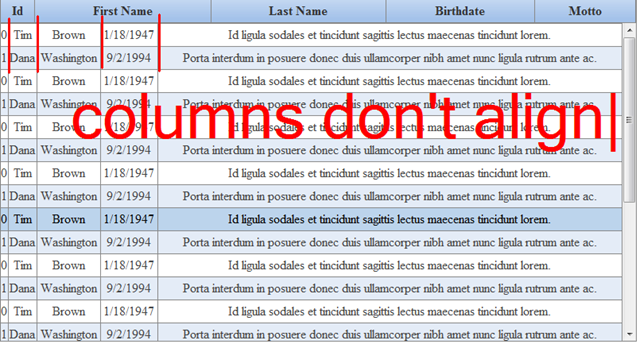 I suppose you could measure the column widths with jQuery of the data table and then set the header widths. I haven’t tried though. I need a help, when i use jquery plugins it works well. but some columns are hidden by default and when the user needs to see those hidden columns, there is a seperate link to show those columns. So the problem is when the user clicks the links to show those hidden columns the header for those are not seen since the header is cloned. so can you help me out. can you help me out please. I’ve learn several excellent stuff here. Definitely worth bookmarking for revisiting. I surprise how much effort you set to create the sort of excellent informative website. This is really useful, I need to tweak it to make it work on our project so I’ve put it on github, hope you don’t mind. If you want to put the original somewhere then I can make push requests. When it comes to licensing would MIT do (fairly permissive) ? hi this is the source code support colspan header?? Hi, Thank you so so much for this share!!! very nice work.. Thank you so much for this plugin !! very great work ! Do you know how to solve this problem? That is a real helpful code,can you please sort the table data when click on the headers …..Thanks in advance ..
Just a quick thank you for the time you put in. I’ve been meaning to write one myself for sometime. Thanks again. this example works great, i have been looking for the fixed header/scrollable body solutions and ended up here, great example.